The innovative Vangater wheelchair lift solves the problem of providing entry for both wheelchair or scooter users and able-bodied passengers with a power tri-folding platform. 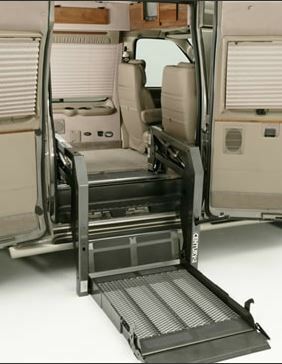 When stowed, the lift platform allows easy entry and exit for able-bodied passengers. Also available for installation in minivans. This wheelchair lift is the true workhorse of the BraunAbility line. Designed for installation in the side or rear doors of a full-sized van, three standard models with platform lengths up to 51" ensure there is a wheelchair lift to fit your needs. The Century Series wheelchair lift is an economical solution to your personal mobility needs. The ingenious design of this lift allows for installation in the side or rear doors of a full-sized van. You'll come to rely on the strength and dependability of the dual hydraulic lifting arms for years to come. 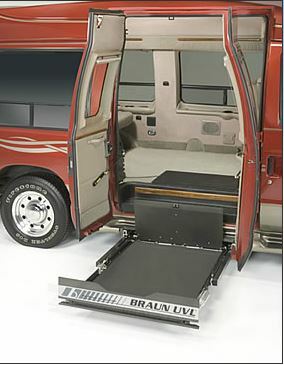 The UVL, or Under Vehicle Wheelchair Lift®, offers an innovative solution to your personal mobility challenges. 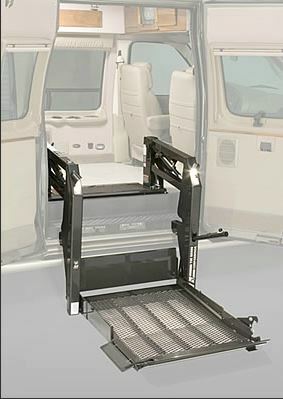 With the wheelchair lift mounted underneath the vehicle, it remains out of sight and out of your way until needed. The lift platform allows easy entry and exit. Convenience and style are two qualities that are blended seamlessly! This wheelchair car lift is available in driver- or passenger-side configurations.